Last week, one of the global teams from Unilever took over Brigade restaurant for a day for a team-building exercise. Unilever’s strategy is all about adding vitality to communities, and the brand is now really immersed in working for the communities it operates in. The team wanted to encapsulate this idea on their day out – as well as to embark on a new challenge together – so taking over Brigade was a great fit for them. During our restaurant takeovers, the participating team usually fills the restaurant with their own guests, clients and partners. This time, we decided to invite a mixture of people we wanted to inspire from our perspective as a charity and social enterprise, so we filled the room with corporates and people working in the homelessness and public sectors. The guys from Unilever arrived early in the morning ready for the challenge. The great thing about a takeover like this is that people have to work with each other in a way they’ve never done so previously. It didn’t matter how senior someone’s role was at Unilever – hierarchy wasn’t a factor because they were in a completely alien environment. Everyone was equal. Nothing was pre-prepared for the meal so they had to make everything from scratch. They made all the bread, peeled the fresh prawns and butchered, marinated and cooked the lamb. In the front of house, they polished the cutlery and glasses and set the tables. It got to the time of day when people were arriving – regardless of whether they were ready or not – and the team had to pull together to make it happen. The most important feedback they gave was how humbled they were to be working alongside our apprentices, who had either been through our programmes or were going through one. The team at Unilever is trying to make peoples’ lives easier through their products every day, so working alongside such inspiring people in a real-life situation was really valuable to them. Later in the day, they didn’t want to stop working! They helped us set up for our supper club that evening by soon-to-be graduate apprentice Grant Ridley and Brigade Head Chef Manuel Mancuso. It was really cool to see how motivated the day made the whole team. Every day, I see people turning their lives around through our programmes at Beyond Food. It’s not comfortable for people to do something so entirely different to start with, but the impact can be life-changing. I’ve had many other experiences recently too, where I’ve seen how possible it is to make a conscious decision to get outside of your comfort zone. Last week I was invited to cook at the Take 3 Colleges event at the RAC Club to raise money for Adopt a School, the Royal Academy of the Culinary Arts charity. I’ve been on committees for Adopt a School for a number of years, where we try to teach primary school children a deeper understanding of food and ingredients. 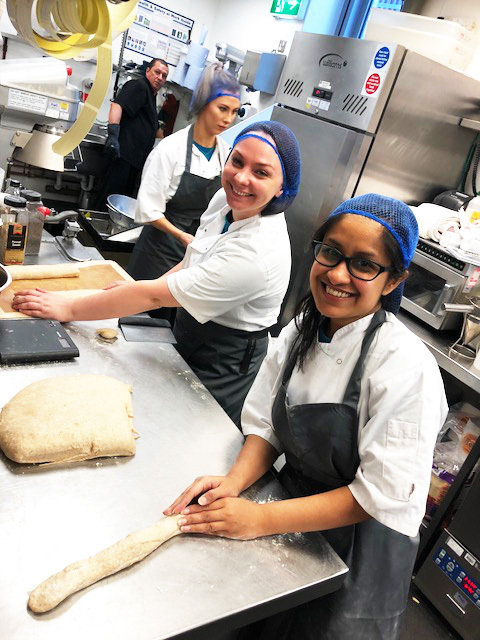 The charity event was also an opportunity for students from three different colleges, including Bournemouth and Poole College where I went, to get real-life experience in a professional kitchen. I was given five students from the college to prepare the main course for 170 people. They’d never done anything like it before and I think it was a brilliant experience for them that they’ll take forward into their futures. I also took my children on a day trip recently to inspire them through local produce. I could have taken them to Brighton or the cinema, but instead we jumped in the car to see what local food producers we could find in our local area. Within just two hours and within a 10-mile radius, we found six amazing food producers. We learned about making cheese at the High Wield Dairy Farm and then stumbled across Tablehurst and Plaw Hatch Community Farm, who produce raw milk, Gouda-inspired cheese and biodynamic pork, beef, lamb and chicken. We also found the Bluebell Vineyard – their sparkling rosé Hindleap wine is absolutely fantastic – and stopped at the 360 Degree Brewing Company. Those guys are making awesome IPAs and a very funky stout, perfect for drinking and cooking Welsh rarebit with. - My children enjoyed an unexpected day out meeting local food producers. As a parent, you’re always trying to open your children’s minds to things, and doing something different like this really does have an impact. It was also wonderful to see how all these suppliers opened their doors to us and talked so enthusiastically about their products, especially when they didn’t know we were coming. We bought a little bit in each place, walking away with lots of goodies. All the children tried things they wouldn’t normally eat. Some of them would only usually eat cheddar cheese, but after this experience, they were dolloping ricotta on their jacket potatoes in the evening! At all levels, there’s something to be said about doing activities you wouldn’t normally do. You don’t always know what the outcome will be, but making unexpected discoveries about yourself and the world makes you feel positive, inspired and alive.